So, having browsed the various accounts online (my two favorites here and here) I determined to make my own setup. 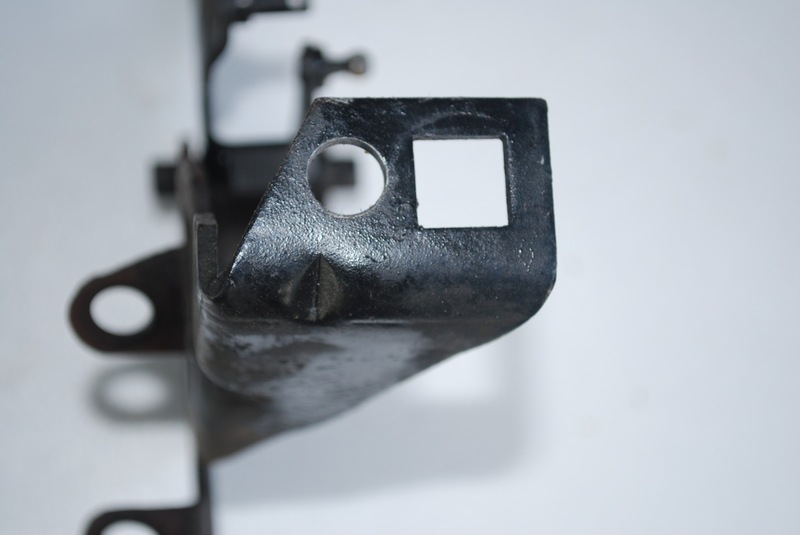 As folks at the JeepsOnly site note, most of the accounts out there treat the throttle linkage in a cursory fashion when it really is the most complex part of what is, overall, a pretty simple project. So I'll also try to focus on that aspect here. Note that I'm working on a CJ5 with the 258 engine and a Carter YF carb. About the most rudimentary of the post-1975 CJ setups. A quick visit to the local bike shop garnered a friction (not an indexed!) 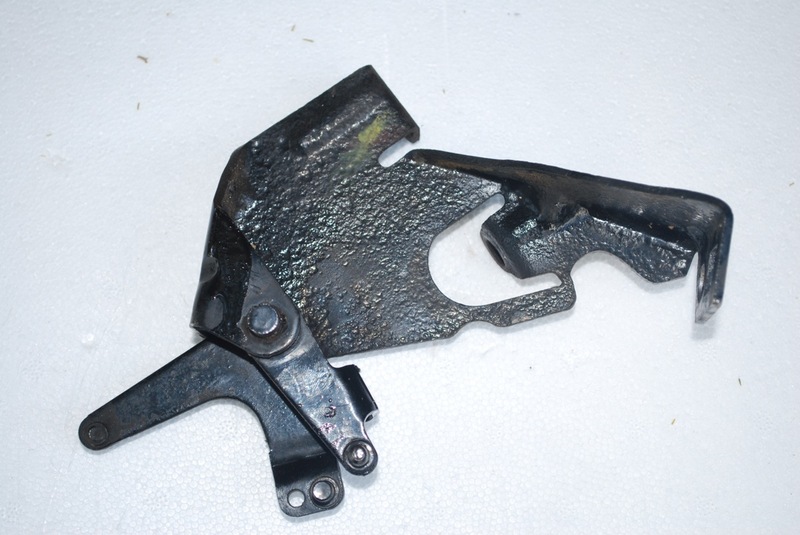 shifter, age unknown - it had been sitting on their shelf for years, unsold; a length of cable, cable housing (about six feet for each), a few cable ferrules to crimp on the cable end and cable stops. Total spent: $16. 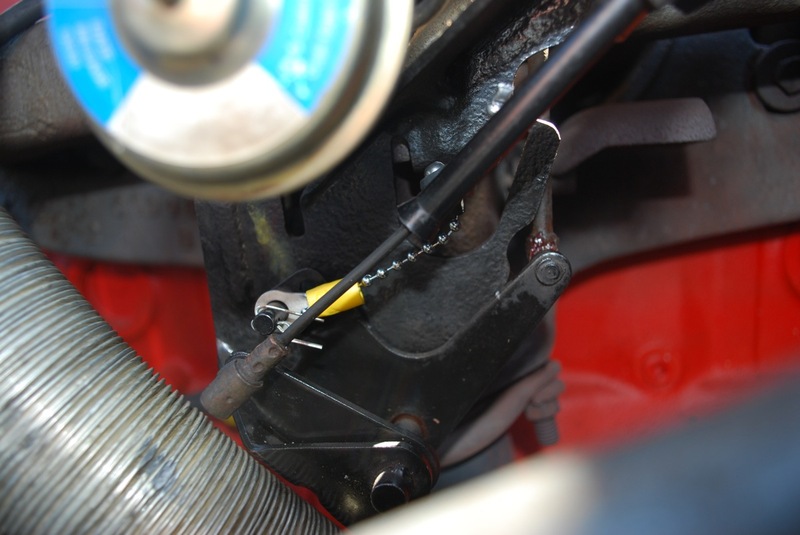 Ben Hollingsworth notes on his page that it is wise to use something like ball chain for the connection between the hand-throttle cable itself and the throttle linkage to allow for unimpeded function of the "real" throttle cable. A quick trip to the local hardware store adds a length of ball chain (of the toilet flapper-valve link variety) to the inventory. And just to make things pretty I also picked up a bit of brass plumbing kit to provide a nice termination point for the cable housing at the carb end of things. 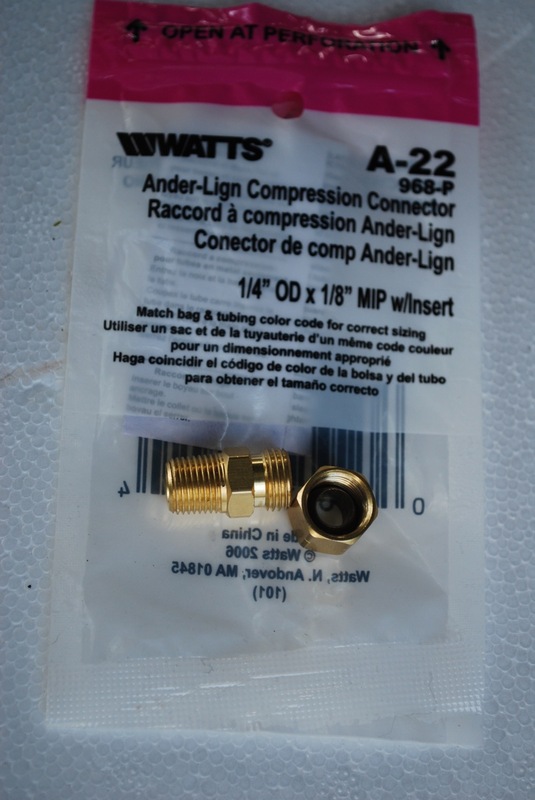 This is an Ander-Lign compression connector (1/4" OD x 1/8" MIP w/insert) - part number A-22 at HomeDepot. I suspect any well-stocked hardware or DIY store will have them or something similar. Having gathered all of the parts it was time for assembly. Unlike most of the other configurations I've seen out there, I opted to mount my throttle control on the steering column. Easier for me to reach either when driving or when standing next to the Jeep and reaching in. 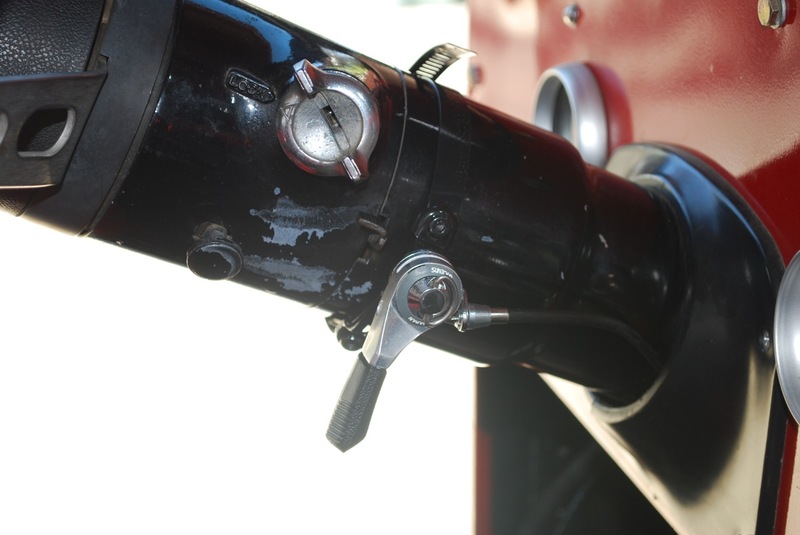 The shifter control is mounted to the steering column using a 3" diameter hose clamp to which I pop riveted the shifter mechanism and then painted most of the assembly black. From here the cable is routed down the steering column through the plastic dashboard fascia and then through a hole I drilled in the firewall immediately adjacent to the steering column. This provides for a fairly short, straight run for the cable as it makes its way to the throttle linkage under the hood. The cable housing terminates at the existing bracket where the "real" throttle cable housing terminates - just a quarter inch or so between the two. As I note above, I used a nifty bit of brass plumbing connection here. The inside diameter of one end perfectly matches the outside diameter of the cable stop fitted over the end of the cable housing. And the cable itself continues right on through the other end of the brass fitting. And there's a nifty nut on the fitting that allows the whole to be clamped to the bracket that the accelerator cable also passes through. Perfect. All I had to do was disconnect the existing accelerator pedal linkage as well as the carb-side linkage and then unbolt the throttle linkage assembly to pull it clear in order to drill the hole through which the brass fitting would fit. (I suppose this part counts as "disassembly" - and I was worried that the two nuts holding the bracket to the exhaust manifold where it mounts would be rusted enough to simply sheer off when I went at them with a socket. Fortunately, the fellow who rebuilt the Jeep years ago used nice stainless nuts and they spun right off. Phew!) Once I had the new hole drilled (7/16" bit in my drill press) and the brass fitting in place I bolted things back together and reconnected the existing links. The last part of the setup is the ball chain connection between the looped cable end and a conveniently unused connection point on the linkage. The ball chain has a big rubber fitting on one end which fit the swaged loop perfectly (improvisation is the name of the game here). Overall, the cable travel is about one inch from idle to full throttle, so my hand-throttle setup only needs a part of that (I don't foresee much need to have the engine wide-open using the hand-throttle). So a bit of measuring and trial and error leads to an appropriate length of ball chain for the setup - about two inches to complete the distance from the cable loop to the attachment point on the linkage. 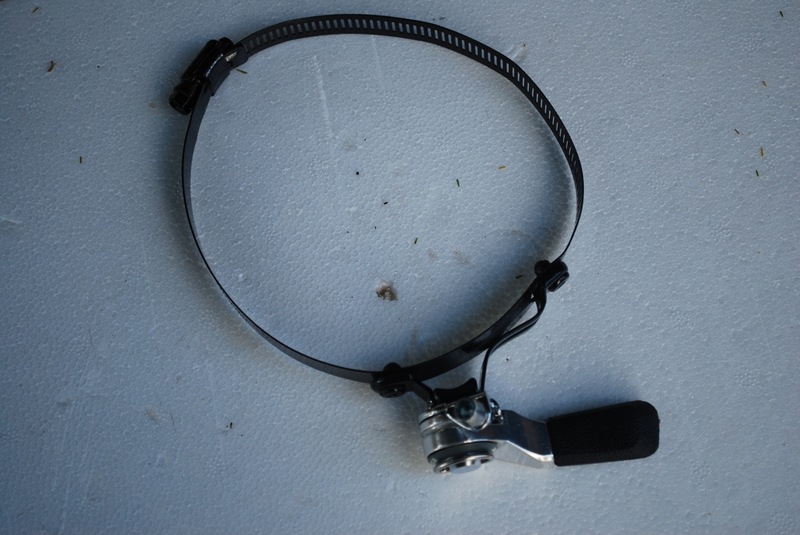 Basically, this is the biggest area of improvisation for anyone doing this sort of project - whatever means you can come up with to terminate the cable and connect it to the throttle linkage for your particular installation. I used what some others have done - an electrical ring terminal whose inside diameter pretty well matched the post on the throttle linkage. This ring terminal was crimped on the end of the ball chain, slipped over the post, and held in place with a cotter pin. With the whole thing assembled I fired up the engine and gave the new throttle a try. A bit of extra slack in the chain meant I pulled the hand-throttle linkage a bit more than I'd expected before throttle response - but it does work! And with the limited scope of cable available I can only rev the engine to about 3,000 rpm which seems like a good safety limit to me. No need to go further and I won't accidentally do so. Total time invested: about an hour of actual assembly work, a day of thinking about things, and ten minutes of back-and-forth getting tools I forgot the first trip to the garage. Total amount invested: about $20.